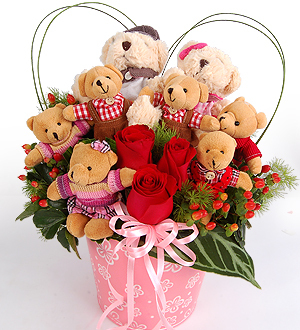 An endearing gathering of Muffin Bears, presented in a love pot with 3 stalks of Red Roses. As each love story is different, our muffin bears also comes in different colors and clothes. Love pot available in several colors - red, yellow, pink and green. For outstation delivery out of Klang Valley, fresh roses will be replaced with more Muffin Bears.